Those who got to the end of the traditional Howe Caverns tour in upstate New York (who hasn't?!) and were left craving more cave are in luck: a section of the cave that's been closed since 1900 is finally opening to the public. And you don't even need a guy named Alfred to get you in. The new Signature Rock Discovery Tour starts where the traditional spelunking ends. Typically, cave-goers venture as far as the dam wall before they hit a set of doors that cannot be entered. And obviously, if a door says "DO NOT ENTER," everyone's gonna want to. On the new tour, participants get to live out that fantasy and go past the point of no return. However, this tour isn't for amateurs, as there are no lights or walkways in this rarely explored section of the underground. 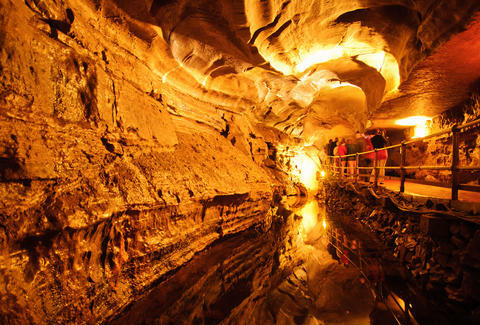 Wearing protective gear, adventurers will enter as usual into Howe Caverns, but after traipsing through several feet of water, tour participants will be able to see signatures carved into the rock by original dwellers over 100 years ago. Hence the name, “Signature Rock Discovery Tour.” Clever Howe Caverns marketing team. Clever. The tour officially opens May 3, so start practicing your deep echo voice now. Check out news coverage on the tour below.